Our 500 hour course is structured to give students the best possible preparation for their professional teaching career. It is also an excellent Yoga Intensive for experienced yogis looking to go deeper into the practical and theoretical aspects of yoga. 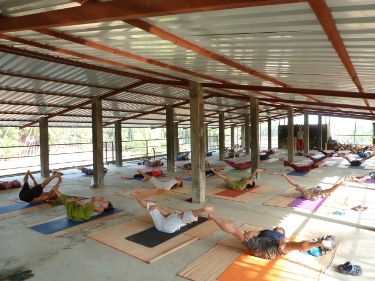 This course compares and contrasts traditional and modern practices of yoga. It is a year's worth of training, compressed into two / three months to save students' learning time. In two / three months, our students become proficient in sixty āsanas. We focus on how to practice and teach each āsana. We teach this course over an optional two / three months but still allow the body and mind adequate time for rest. We believe that the body and mind perform at optimal level when work is interspersed with enough rest periods. For the body to physically learn new āsanas without injury, one needs at least two months. To induce stress results in wear and tear to muscles and joints and imprints stress in the body and mind. This makes meditation impossible. It also permanently reduces muscle quality thereby shortening the yogi's professional career. Our courses are designed to optimize students' learning and have them leave refreshed, relaxed and equipped as educated professionals.